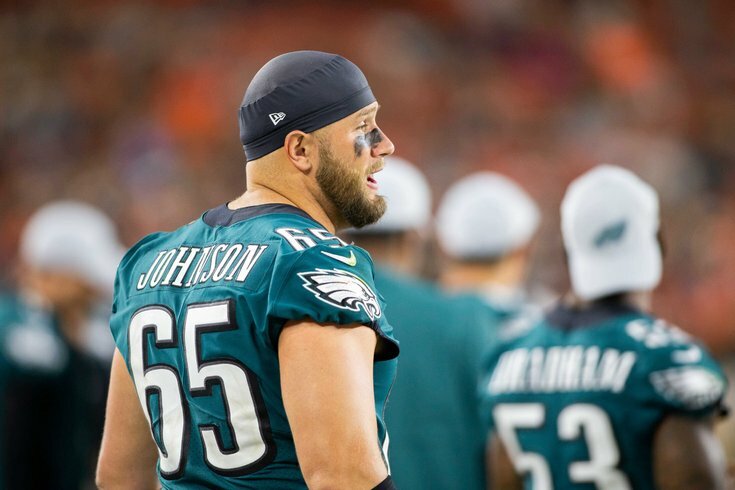 Lane Johnson has reportedly restructured his contract with the Eagles. As usual, the Philadelphia Eagles are banged up heading into their matchup this Sunday against the New Orleans Saints. The Saints have a couple of injuries of note, but are very healthy for a Week 11 game. • CB Ronald Darby (knee): Darby tore his ACL and is done for the season. The Eagles have not yet placed him on IR, so he remains on the injury report for now. • CB Jalen Mills (foot): Rasul Douglas filled in for Mills last Sunday against the Cowboys and struggled mightily. The expectation here is that he will once again get the start on the outside against New Orleans. Sidney Jones could start in place of Darby at the other outside spot, and Avonte Maddox will likely play in the slot. • RB Darren Sproles (hamstring): This will now be the ninth straight game that Sproles will miss after injuring his hamstring Week 1 against the Atlanta Falcons. He's been day-to-day for almost three months. In anticipation of Sproles' return, the Eagles released punt returner DeAndre Carter. With Sproles' setback and Carter's release, recently acquired Golden Tate handled punt return duties last week, and will likely do so again on Sunday..
• TE Josh Perkins (knee): Perkins will be out for a substantial amount of time with a knee injury. The Eagles have since activated Richard Rodgers off of IR in anticipation of missing their third tight end. • OT Lane Johnson (knee): Johnson was expected to play last Sunday against Dallas, per Doug Pederson, but Johnson was unable to go. The Birds could use him this weekend against stud pass rusher Cameron Jordan. • DT Haloti Ngata (knee): I think we can safely say at this point that Ngata was a bad signing. • S Rodney McLeod (IR): McLeod is done for the season after tearing his MCL during the Eagles' win over the Indianapolis Colts. On the season, he had 10 tackles and four pass breakups, which doesn't properly convey the positive contributions he made in the first three games. McLeod's was replaced initially by Corey Graham, and later Avonte Maddox. • DT Timmy Jernigan (NFI): Jernigan started the season on the NFI list, which is essentially an extension of the PUP list, meaning he was required to be out for at least the first six weeks of the season, though it has already extended beyond that. Jernigan was very productive early in the season last year, but his play tailed off a bit down the stretch. He has been replaced in the lineup by a whole bunch of bodies who, on the whole, have not produced. Jernigan began practicing last week, but he remains on NFI. • WR Mike Wallace (IR): Wallace, formerly the Eagles' No. 2 receiver, broke his fibula against the Buccaneers. He'll be out at least 8 weeks on injured reserve, though Doug Pederson noted that it may not be a season-ending injury. • WR Mack Hollins (IR): The Eagles will also be without their No. 4 receiver, as the Eagles placed Hollins on IR with a groin injury. • ST Chris Maragos (PUP): Maragos is still recovering from a serious knee injury suffered Week 6 last year against the Carolina Panthers. He started the season on PUP, so he'll miss at least the first six games. Like Jernigan, Maragos was not ready at the conclusion of those six weeks. • LT Terron Armstead: Armstead is a stud left tackle, and he is expected to be out 3-4 weeks, beginninng with the Eagles this Sunday. The #Saints are expected to be without LT Terron Armstead for a period of roughly 3-4 weeks, source said. Armstead injured his pec during last week’s game and was replaced by Jermon Bushrod. They face the #Eagles this week. He'll likely be replaced in the lineup by Jermon Bushrod. • DE Marcus Davenport: Davenport is also expected to miss about a month with a toe injury. #Saints rookie pass-rusher Marcus Davenport is expected to miss about a month with a toe injury, I’m told. After that, they’ll judge how it has responded. He’s in a boot now. Bad timing, as the first-rounder was really coming on. The Saints gave up a lot to move up and select Davenport in the first round of the 2018 NFL Draft, and he has paid off, collecting 4 sacks in his first 7 games as a pro. • CB Patrick Robinson: Robinson signed with the Saints in free agency after his stellar year as the Eagles' slot corner. He had surgery to repair a broken ankle, and is done for the season. • WR Dez Bryant: Bryant signed with the Saints, and almost immediately tore his Achilles. He's done for the season. • WR Ted Ginn: In four games, Ginn had 12 catches for 135 yards and 2 TDs. He went on IR with a knee injury, but could return at some point this season.